Louis Béroud (1852–1930), The Mona Lisa in the Louvre (1911), further details not known. Wikimedia Commons. 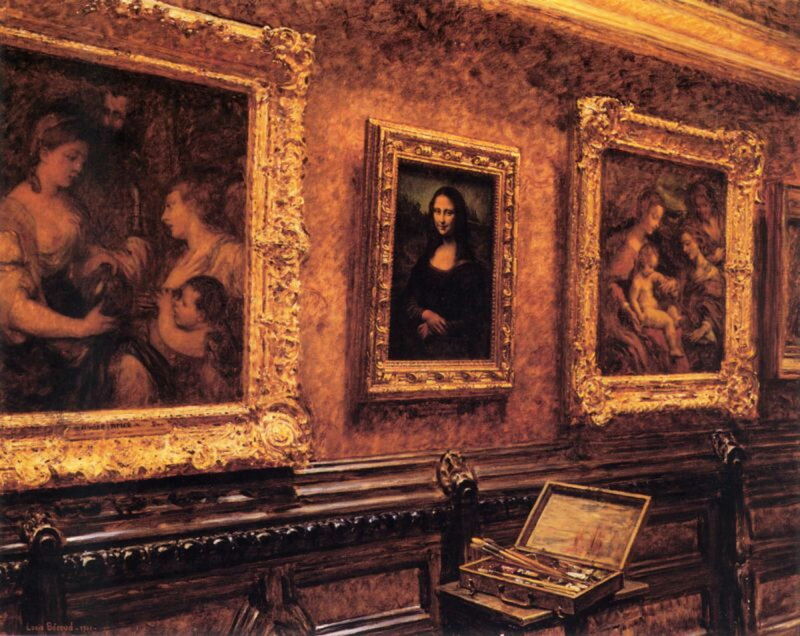 Prior to 1498, Leonardo da Vinci had enjoyed a settled period working in Ludovico Sforza’s court in Milan. With the invasion of the Duchy of Milan, he fled first to Venice, then to Cesena, before returning to his home city of Florence in 1503. During this unsettled period, he seems to have been working on two main paintings: the second version of the The Virgin of the Rocks, and a new painting of the Madonna with the Yarnwinder. Although his original of the latter work doesn’t appear to have survived, there are two copies which were probably made in his workshop in the period between about 1501-07. 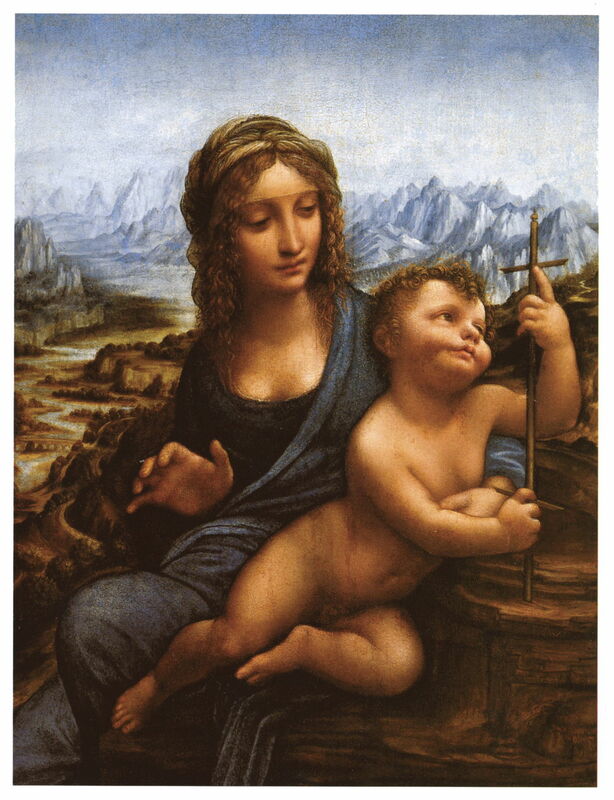 Leonardo da Vinci (1452–1519) (after), Madonna of the Yarnwinder (c 1501-07), oil on panel, 48.3 x 36.9 cm, Private collection (Duke of Buccleuch). Wikimedia Commons. The first, in the private ownership of the Duke of Buccleuch in Scotland, has evidence of technical shortcomings that make it most unlikely ever to have felt the brush of the master himself, but gives some clue as to what Leonardo’s original – if it ever existed – might have shown. The version below, in a private collection in the USA, may have been painted by Leonardo’s assistant Giacomo Salai over the same period. Leonardo da Vinci (1452–1519) (after), Madonna of the Yarnwinder (c 1501-07), oil on panel, 50.2 x 36.4 cm, Private collection (USA). Wikimedia Commons. Leonardo is believed to have produced the design for these paintings, as a commission for the secretary to the King of France in 1501, and a preparatory drawing by Leonardo in the British Royal Collection provides further evidence of his involvement. 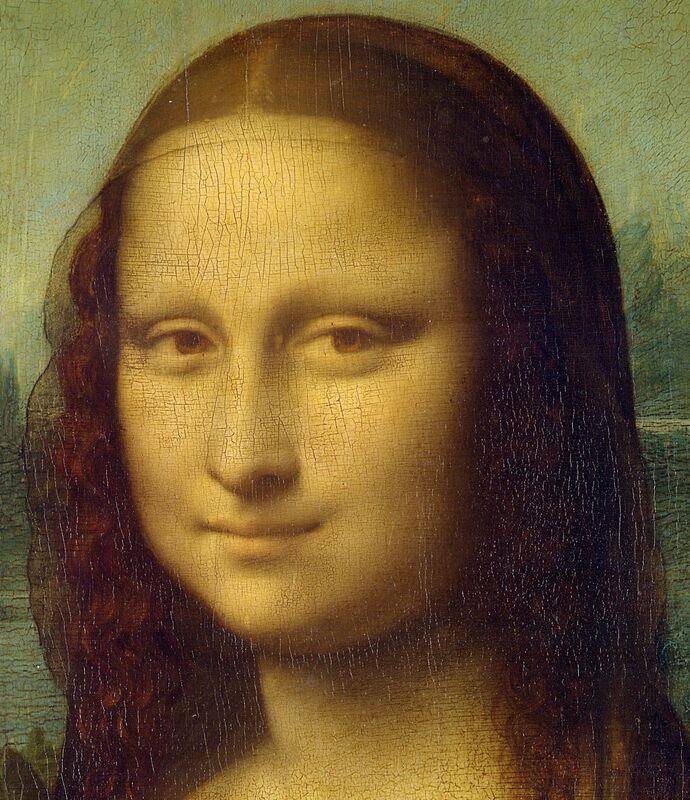 Leonardo’s next surviving work is the most famous European painting, the single exhibit of the Louvre in Paris which is responsible for drawing millions of its visitors each year: the Mona Lisa. 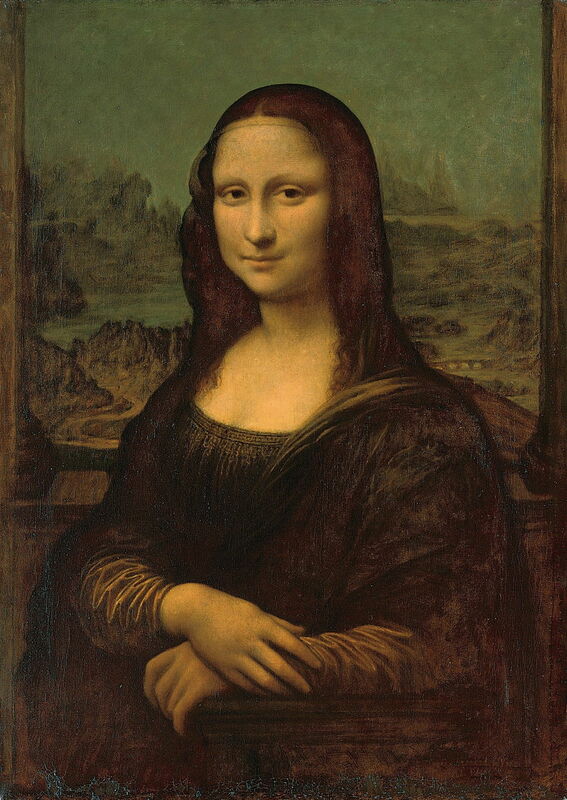 Leonardo da Vinci (1452–1519), Portrait of Lisa del Giocondo (‘Mona Lisa’) (1503-06), oil on poplar wood, 77 x 53 cm, Musée du Louvre, Paris. Image by C2RMF, via Wikimedia Commons. This quite modest portrait of Lisa Gherardini (1479- after 1551?) was painted for her husband, Francesco del Giocondo (1460-1539), a Florentine merchant in silk. It was apparently made to celebrate the birth of their second son in December 1502, and their moving into their own home the following Spring. 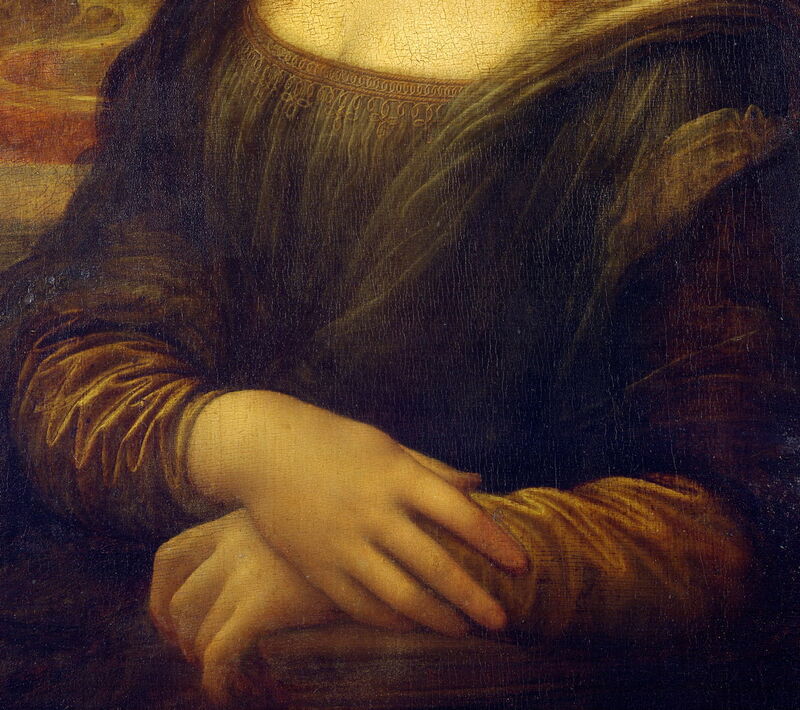 Leonardo da Vinci (1452–1519), Portrait of Lisa del Giocondo (‘Mona Lisa’) (detail) (1503-06), oil on poplar wood, 77 x 53 cm, Musée du Louvre, Paris. Image by C2RMF, via Wikimedia Commons. Although small in size and almost retiring in reality, it is one of the most technically advanced oil paintings of its time. Leonardo used multiple thin glaze layers consisting largely of binder with just a little pigment to develop the subtle shadows of the flesh. 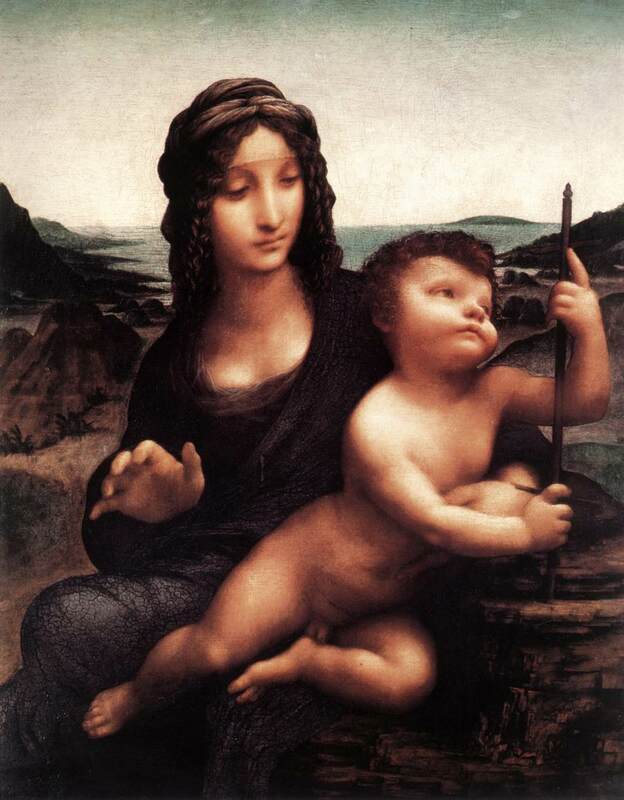 This was so admired by other masters of the day that it was named sfumato, Leonardo’s smoke, for its subtlety. But there is more to this painting that those multiple glazes of sfumato on the woman’s face: the hands, the delicate patterning and folds in the clothing, and the landscape background. Many artists have a few paintings in which everything just works right: in the Mona Lisa, Leonardo achieved perfection. The oil paint on the Mona Lisa was still drying when the young Raphael used it as inspiration for his first female portraits in around 1505. However, Leonardo is reputed to have still been working on it as late as 1506, and some now claim that he may have continued to make final adjustments, perhaps just another fine glaze here and there, to 1513-16. As with his Last Supper, the Mona Lisa has been copied, revisited, and parodied endlessly. After Leonardo’s death, it returned to Milan, before being sold to the King of France. It went on display in the palace at Fontainebleau, where it remained for two centuries, then it moved to Versailles and the Tuileries in Paris. After four years hanging in Napoleon’s bedchamber, it was taken to the Louvre in 1804. 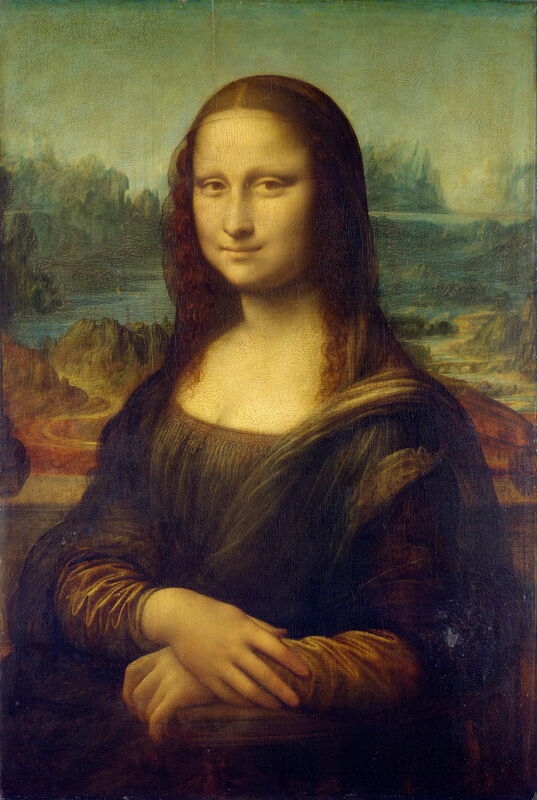 In 1911, Louis Béroud, an artist who painted many works showing copyists at work in front of famous paintings in the Louvre, started painting a view of the Mona Lisa being copied, in The Mona Lisa in the Louvre. The copyist is missing, though, as if to symbolise the disappearance of the painting. It was probably this painting that Béroud was working on when the Mona Lisa disappeared on the 21st August 1911. Louis Béroud (1852–1930) (attr), Copy of the Mona Lisa after Leonardo da Vinci (date not known), oil on canvas, 77 x 55 cm, location not known. Wikimedia Commons. More sinister still is this copy of the Mona Lisa, which has been attributed to Béroud. It is undated, but was it painted before or after the disappearance of the original? Might it have been intended as a replacement for the original, or could Béroud just have used it as a substitute while he completed the painting above? At the time, the police arrested first the poet Guillaume Apollinaire, then questioned Pablo Picasso. The painting appeared lost, until two years later, when Vincenzo Peruggia tried to sell it to the Uffizi Gallery in Florence, Italy. Being something of an Italian patriot, Peruggia had decided that it was time for the painting to return to its homeland, and had smuggled it out of the Louvre under his coat. He served six months in prison, and Leonardo’s finest painting headed back to Paris. Luke Syson, Larry Keith et al. (2011) Leonardo da Vinci, Painter at the Court of Milan, National Gallery (London). ISBN 978 1 85709 491 6. Frank Zöllner (2017) Leonardo da Vinci, the Complete Paintings, Taschen. ISBN 978 3 8365 6297 3. Posted in General, Life, Painting and tagged Béroud, da Vinci, Mona Lisa, painting, Raphael, Salai. Bookmark the permalink. The Quest for Sparse Files in APFS: do they exist?